In what appears to be an amazing success for American medicine, preliminary government figures released Wednesday showed that the annual number of deaths in the U.S. dropped by nearly 50,000 in 2004, the biggest decline in nearly 70 years. The 2 percent decrease, reported by the National Center for Health Statistics, came as a shock to many, because the U.S. is aging, growing in population and getting fatter. In fact, some experts said they suspect the numbers may not hold up when a final report is released later this year. Nevertheless, center officials said the statistics, based on a review of about 90 percent of death records reported in all 50 states in 2004, were consistent across the country and were deemed solid enough to report. The center said drops in the death rates for heart disease, cancer and stroke accounted for most of the decline. "We were surprised by the sharpness of the decrease. It's kind of historical," said statistician Arialdi Minino, lead author of the report. The government also said that U.S. life expectancy has inched up again to 77.9 years, a record high but still behind that of about two dozen other countries. "The net effect is incredibly positive," Dr. David Lipschitz tells CBS News correspondent Russ Mitchell. "It seems as if we're all living longer. And not only that, we're living better." Lipschitz, who is an expert on aging, says we have to change the way we think. "What we know about aging is that the idea that a 65-year-old is elderly is quite preposterous." The preliminary number of U.S. deaths recorded for 2004 was 2,398,343. That represents a decline of 49,945 from the 2,448,288 recorded in 2003. 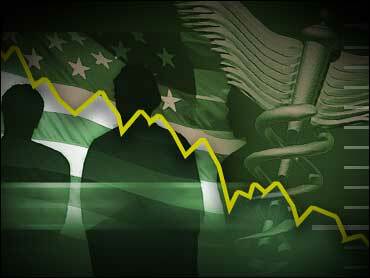 U.S. deaths ordinarily rise slightly each year. The last decline in annual deaths occurred in 1997, a modest drop of 445 deaths from 1996, Minino said. The number of deaths has not dropped this steeply since 1938, when there were about 69,000 fewer than in 1937. A drop in 1944 came close, about 48,000 fewer deaths than the previous year. Health officials could not immediately say why the number of deaths fell so sharply in either of those years. To see such a giant drop after years of annual increases was a little hard to swallow for some. Heart disease continues to be the leading cause of death, accounting for 27 percent of the nation's deaths in 2004. Cancer was second, at about 23 percent, and strokes were third, at 6 percent. The good news: The age-adjusted death rate for all three killers dropped. The heart disease rate declined more than 6 percent, the cancer rate about 3 percent, and the stroke rate about 6.5 percent. Improvements in medical care, particularly in medications aimed at preventing heart disease, at least partly explain the improvements in the heart disease death rate, said Ken Thorpe, an Emory professor of health policy. Also, the flu season for 2004 was milder than 2003, which helped explain the more than 7 percent drop in the influenza death rate, Minino noted. The death rates for 11 of the 13 other leading causes of death also declined, with only Alzheimer's disease (the No. 7 killer) and high blood pressure and kidney disease related to high blood pressure (No. 13) inching up. Even officials at the National Center for Health Statistics were "really kind of concerned" when they first saw their own numbers, said Bob Anderson, the agency's chief of mortality statistics. But the fact that decreases in the death rate were found nationwide gives them confidence that the findings are legitimate, and not the result of something like changes in data collection. The government also reported that a baby born in 2004 could expect to live to nearly 78, an increase of almost half a year from 2003. Women now have a life expectancy of 80.4, up from 80.1. Male life expectancy is 75.2, up from 74.8. The life expectancy for whites, 78.3, was up only slightly from the previous year. The increase for blacks was larger, with a rise from 72.7 to 73.3. The government also reported that the infant mortality rate has dropped to 6.76 deaths per 1,000 births, down from 6.85 the year before. But a huge racial disparity persists. The rate for whites was 5.65 per 1,000 births, for blacks, 13.65. Japan, Monaco and San Marino had the highest life expectancy, 82 years, in 2004, according to World Health Organization statistics. Australia, Iceland, Italy, Sweden and Switzerland have a life expectancy of 81. Canada, France, Israel, Norway, Spain and Britain are among the other countries with life expectancies above 78.